Although much of the focus of Au exploration and acoustic decrepitation is on the CO2 content of fluid inclusions, other gases such as CH4 and N2 also give the same low temperature decrepitation peaks as seen on CO2 rich samples. This is a consequence of the fact that all these gases, above their critical point temperatures, behave in accordance with the gas law, namely PV=nRT. This behaviour is completely independent of the nature of the gas species and only subject to variations due to the non-ideal behaviour of some gases. However, at the temperatures and pressures used in acoustic decrepitation analyses, these variations from ideallity are very small and do not affect the results at all. To demonstrate this, I have used the modified Redlich & Kwong equation of state to calculate the behaviour of CO2, CH4 and N2 at 2 different molar volumes using a computer program from Holloway, 1980. 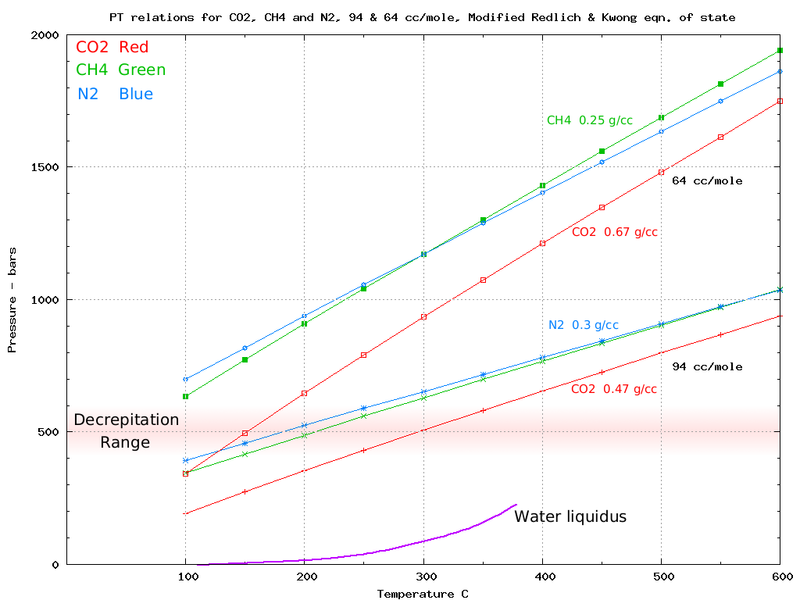 The results, plotted below, show that these 3 gases behave similarly and that decrepitation of inclusions containing any of these gases, or mixtures of these gases, will all develop high internal pressures and decrepitate at low temperatures, as explained in the item: Why CO2 rich fluid inclusions decrepitate at low temperatures. The small differences between gases due to non-ideallity are of no consequence to the acoustic decrepitation method.